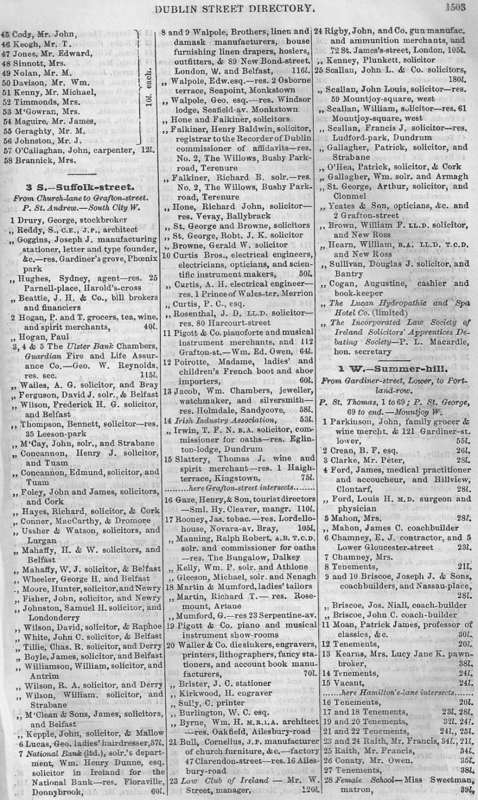 From 1893 a list of premises on Dublin’s Suffolk Street. Amongst them were a lot of Solicitors , the ‘Incorporated Law Society of Ireland Solicitors Apprentices Debating Society’ , Electrical Engineers and a Gun manufacturer. 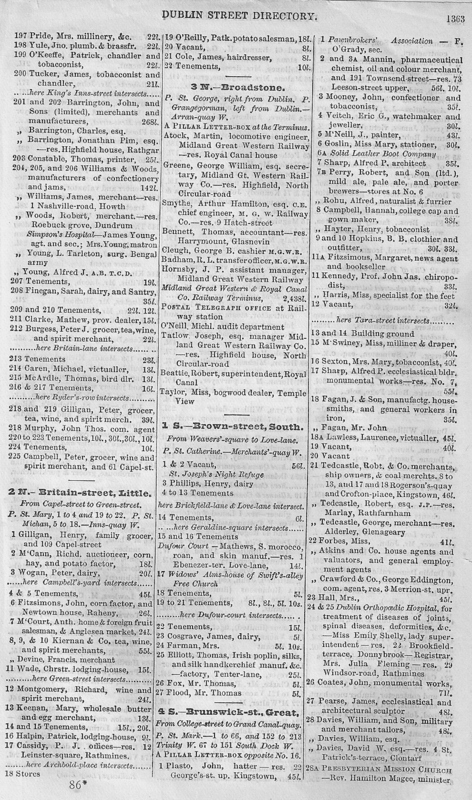 From the 1893 Thoms directory a list of residents and business on Brunswick Street (now Pearse Street), Broadstone and Britain Street Little. 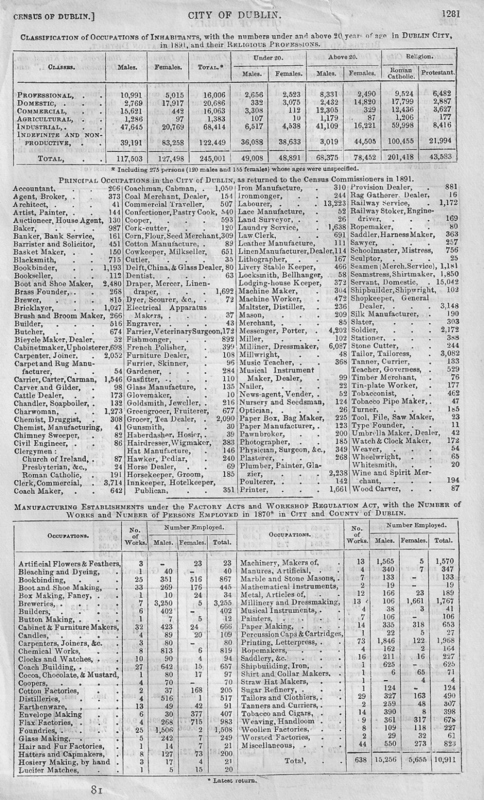 A description of Donabate and the rate payers from 1893. 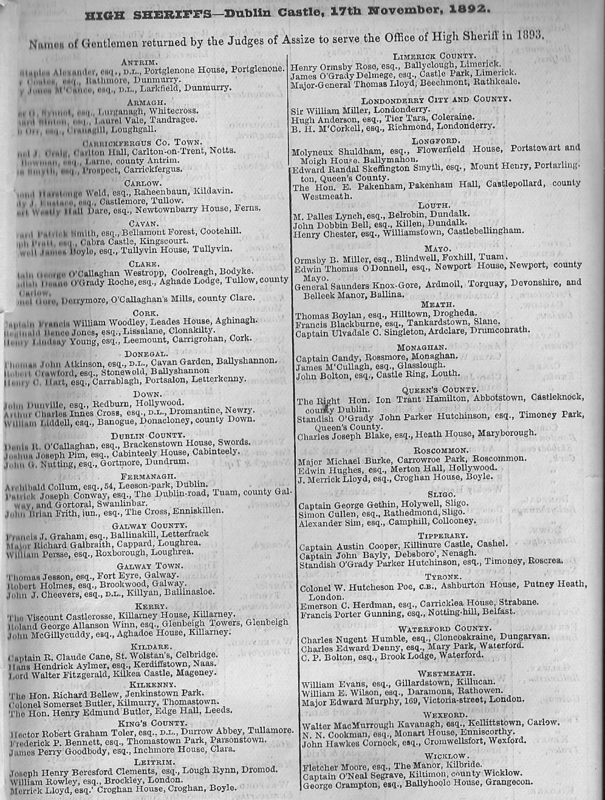 From 1893 a list of premises on Dublin’s Grafton Street. Then what business names do I recognize…. Hodges Figgis & Co are there as are James J Fox , Tobacco and cigar merchant. Switzer & Co limited occupy numbers 88 and 88 1/2 as well as 91,92 and 93. TIPPERARY, an inland county in Munster province. Boundaries: N., Galway and King’s ; E., King’s, Queen’s and Kilkenny ; S. Waterford,. W., Cork, Limerick, Clare, and Galway. Greatest length, N. and 5., 70 miles greatest breadth, K. and W., 40 miles; comprising an area of 1,061,731 acres ; of which 244,426 are under tillage, 621,364 in pasture’ 21,620 in plantations, 160,720 waste, bog, mountain, &c., and 13,601 under water. The surface rises into tlie mountains of Knockmeledown, the Galtees, and Slievenaman in the S., the group of which Keeperhill is the principal in the W., and into the Slievardagh hills, E. The ,soil of the level country is a rich calcareous loam, of extraordinary fertility, particularly in the tract called the Golden Vale, extending from Limerick to the confines of Kilkenny county. ; ‘and in the centre • of which is Tipperary town, and in another similar tract of level ground, in the Ormond baronies. The Suir and Nore rise in the Devil’s Bit mountain, near Templemore; the former, for the greater part of its course, running through the county; the Shannon forms part of its western boundary., The subsoil is clay-slate in the mountain districts, and limestone in the more level tracts,–which form part of the great central plain of Ireland, and include some branches of the Bog of Allen.:! 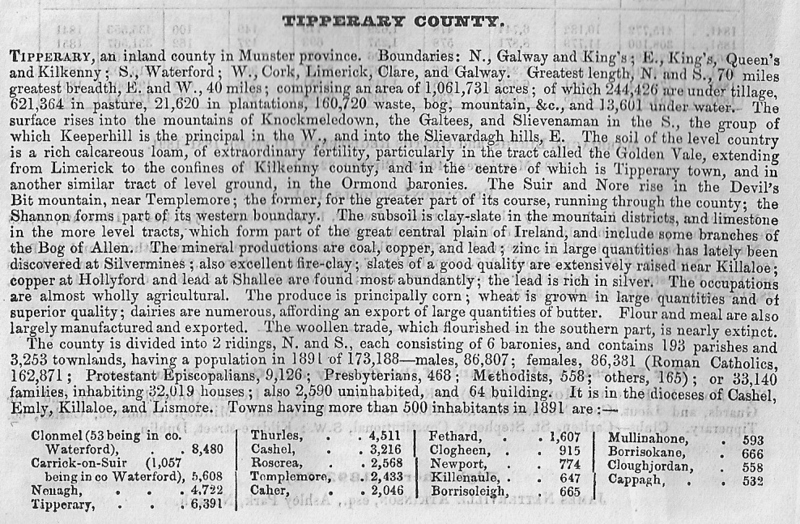 ‘The mineral productions are coal, copper, and lead in large quantities has lately been discovered at Silvermines ; also excellent lire-clay; ‘slates of a good quality are extensively raised near Killaloe copper at Hollyford and lead at Shallee are found most abundantly; the lead is rich in silver. The occupations . are almost wholly agricultural. The produce is principally corn ; wheat is grown in large quantities and of superior quality; dairies are numerous, affording an export of large quantities of butter. Flour and meal are also largely manufactured and exported. The woollen trade, which flourished in the southern part, is nearly extinct. The county is divided into 2 ridings, N. and S., each consisting of 6 baronies, and contains 193 parishes and 3,253 townlands, havin a population in 1891 -of 173,188—males, 86,807; females, 86,381 (Roman Catholics, 162,871 ; Protestant Episcopalians, 9,126; Presbyterians’ 468; Methodists, 558; others, 165) ; or 33,140 families, inhabiting 32,019 houses ; also 2,590 uninhabited, and 64 building. It is in the dioceses of Cashel, Killaloe, and ‘Lismore. HIGH SHERIFFS—Dublin Castle, 17th Novomber, 1892. Names of Gentlemen returned by the Judges of Assize to serve the Office of High Sheriff in 1803. ANTRIM. Staples, Alexander, esq Portglonone House, Portglenone. Coates.esq, Rathmore, Dunmurry. Jones M’Cance, esq., Larkfield, Dunmurry. ARMAGH. G Synott esq. Lurganagh, Whitecross. Sinton.esq,Laurel Vale, Tandragee. Off Esq.,Cranagill, Loughgall. CARRICKFERGUS CO. TOWN. J Craig, Carlton Hall, Carlton-on-Trent, Notts. Bowman esq , Larne. county Antrim. Smyth esq, , Prospect, Carrickfergus. CARLOW. hastings Weld, esq., Raheenbaun, Kildavin. J Eustace esq, Castlemore, Tullow. ,Westly Hall Dare esq, Newtownbarry House, Ferns. CAVAN. Patrick Smith esq, Bellamont Forest, Cootehill. Joseph Pratt, Cabra Castle, Kingscourt. well Jamas Boyle, esq., Tullyvin House, Tullyvin. CLARE. George O’Callaghan Westropp, Coolreagh, Bodyke. Deane O’Grady Roche, esq., Aghade Lodge, Tullow, county Carlow. Gore, Derrymore, O’Callaghan’s Mills, county Clare. CORK. Captain Frabcis William Woodley, Leades House, Aghinagh. Reginald Bence Jones, esq., Lissalane, Clonakilty. Henry Lindsay Young, esq., Leemount, Carrigrohon, Cork. Henry C Hart, esq., Carrablagh, Portsalon, Letterkenny. DOWN, John Dunville, esq., Redburn, Hollywood. Arthur Charles Innes Cross, esq., D.L., Dromantine, Newry. William Liddell, esq., Banogue, Donacloney, county Down. DUBLIN COUNTY. Denis R. O’Callaghan, esq., Brackenstown Houso, Swords. Joshua Joseph Pim, esq., Cabinteely House, Cabinteely. john G. Nutting, esq., Gortmore, Dundrum. FERMANAGH. Archibald Collum, esq., 54, Leoson-park, Dublin. Patrick Joseph Conway, req., ‘The Dublin-road, Tuam, county Gal-way, and Gortoral, Swanlinbar. John Brian Frith, jun., esq., The Cross, Enniskillen. GALWAY COUNTY. Francis J Graham, esq., Ballinakill, Letterfrack . Major Richard Galbraith, Cappard, Loughrea. William Pearse, esq., Roxborough, Loughrea. GALWAY TOWN. Thomas Jesson, esq., Fort Eyre, Galway. Robert Holmes, esq., Brookwood, Galway. John J. Cheevers, esq., D.L., Killyan, Ballinasloe. KERRY. The, Viscount Castlerosse, Killarney House, Killarney. Roland George Allanson Winn, req., Glenbeigh Towers, Glenbeigh John McGillycuddy, esq., Aghadoe House, Killarney. KILDARE. Captain R. Claude Cane, St. Wolstan’s, Celbridge. Hans Hendrick Aylmer, req., Kerdiffstown, Naas. ,Lord Walter Fitzgerald, Kilkea Castle, Mageney. KILKENNY. The Hon. Richard Bellow, Jenkinstown Park. Colonel Somerset Butler, Kilmurry, Thomastown. The Hon. Henry Edmund Butler, Edge Hall, Leeds. KING’S COUNTY. I lector Roliert Graham Toler, req.. DL., Durrow Abbey, Tullamore. Frederick P. Bennett, req., Thomastown Park, Parsonstown. James Pen-y Goodbody, esq., Inchinore House, Clara. LEITRIM. Joseph Henry Beresford Clements, req., Lough Lynn, Dromod. William Rowley, req., Brockley, London. Merrick Lloyd, esq.’ Croghan louse, Croghan, Boyle. LIMERICK COUNTY. Henry Ormsby floes, req., Ballyclough, Limerick. James O’Grady Delmege, esq., Castle Park, Limerick. Mojor-General Thomas Lloyd, noecinnont, Ratlikettle. LONDONDERRY CITY AND COUNTY. Sir William Miller, Lonciondorry. Hugh Andorson, esq., Tier Tara, Coleraine. B. 11. M’Corkell, esq., Richmond, Londonderry. LONGFORD. Molyneux Shuldham, esq., nowerfield House, Port-ate \\art and Sleigh Home. Ballymahon. Edward Randal Skeffington Smyth, req., Mount Henry, Portarling. Ws, Quern’s County. The Hon. E. Pakenham, Pakenham Hall, Caetlepollard, county Westmeath. LOUTH. M. Pall. Lynch, req., Belrobin, Dundalk. Jolla Dobbin Bell, esq., Killen, Dundalk. Henry Chester, esq., Williamstown, Castlobellingliam. MAYO. Ormsby II. Miller, esq., Blindwell, Foxhill, Than, Edwin Thom. °Donnell, esq., Newport Douse, Newport, county Mayo. General Saunders Knox-Gore, Ardmoil, Torquay, Dovonshiro, and Belleek Manor, Bonilla. MEATH. Thomas Boylan, req., Hilltown, Drogheda. Francis Blackburn°, esq., Tankardstown, Slane. Captain lilvadalc C. Singleton, Ardclare, Drumcourath. MONAGHAN. Captain Candy, Rossmore, Monaghan. Joines esq., Glasslough. John Bolton, req., Castle Ring, Louth. QUEENCOUNTY. u Ion Trout Abbotstown, Cm:del:nook, Standish O’Grady John Parker Hutchinson, esq., Timoney Park, Queen’s County. Charles Joseph Blake, esq., Heath Ilinne, Mmyborough. Rosso:quo:I. Major Michael Burke, Carrowroo Park, Roscommon. Edwin Hughes, esq., Merton Hall, Hollywood. J. ‘Merrick Lloyd, esq., Cwghan Douse, Boyle. Sum, Captain George Gothin, Holywell, Simon Cullen, esq., Rathedmonci,Sligo. Alexander She, rsq., Camphill, Collooney. TIPPERARY. Captain Austin Cooper, Itillinure Castle, Cashel. Captain John Bayly, Debsboro’, Nenagh. Standish O’Giody Parkor Hutchinson, esq., Timoney, Roscrea. Tenures. Colonel W. Hutcheson Poe, Cll., Ashburton House, Putney Heath, London. Emerson C. Herdnian, req., Carricklea House, Strabane. Francis Porter Gunning, req., Notting-hill, Belfast. WATERFORD COUNTY. Charles Nugent Humble, esq., Cloncoalcsaine, Dungarvan. Charles Edward Denny, esq., Mary Park, Waterford. C. P. Bolton, esq., Brook Lodge, Waterford. WESTMEATH. William Evans, esq., Gillardstown, Killucon. William E. Wilson, esq., Daramona, Itathowen. Major Edward Murphy, 105, Victotia4street, London. WEXFORD. Walter Mac5furrough Kavanagh, esq., Kellittatown, Carlow. N. N. Cookman, 0011., Monad, House, Enniscorthy. John Ilawk. Cornock, .4., Cromwellsfort, Wexford. WICKLOW. Fletcher Moore, esq., The Manor, Kilbride. Captain O’Neal Segrave, Kiltinion, county Wicklow. George Crampton, eaq., Ballyhoolo House, Granges..